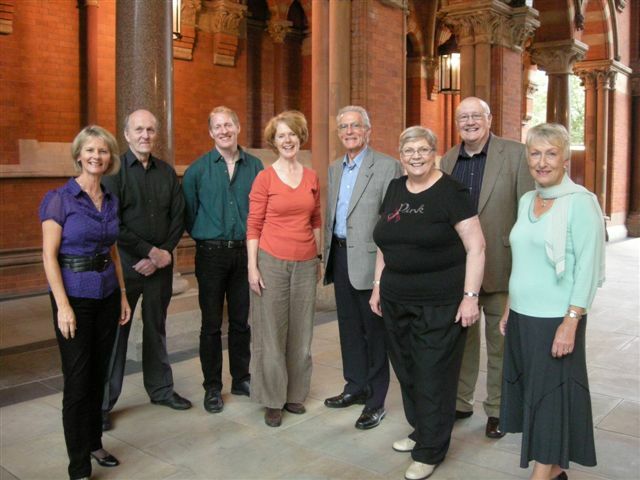 On 27 January 2008 six groups of a cappella singers (96 singers in total) from varying musical styles came together for a day festival of quality coaching, and singing to each other. They enjoyed the experience so much that it was agreed that a British a cappella organisation should be brought into existence so that there could be more of the same! Two more festivals were subsequently organised, the latest on 7 March 2010. On 11 October 2009 the inaugural General Meeting was held in the boardroom of The Betjeman Arms at St Pancras International station. A constitution was adopted and a National Executive Committee elected: Jean Digby as Chairman; Bob Bissett, Treasurer; Tom Digby, General Secretary; Belinda Magee, Membership Secretary; Cathy Davies, Events Co-ordinator; Ian Tolley, Website Manager and Kate Bissett, Minutes Secretary. All were current members of the steering group. One vacancy was left unfilled – that of Public Relations & Marketing Officer. Suzi Digby (no relation – honest!) was adopted as our Honorary President by a unanimous vote. The society's aim was to support groups singing in harmony and singing predominantly a cappella, from duets through to large choirs and choruses. We'd hoped that Sing a Cappella! would be of particular appeal to those groups or musical styles for which there is no support organisation currently in existence. Barbershop choruses and quartets have their own associations in the UK which offer all this and more for them. College groups are similarly supported by The Voice Festival UK. The initial challenge continues, ie. to discover just who is out there singing a cappella either in mixed voice groups or in all men or all women groups around the UK. No-one really knows. We had 37 groups affiliate to us early on, but we suspect that it's just the tip of the iceberg. Also at the beginning we had a scheme for Individual Membership, but at our first AGM in October 2010 we also introduced a scheme of Group Membership, whereby both the group and all of its singers became members. We also introduced a different kind of workshop which was based on the individual rather than on singing groups. We all enjoyed Suzi Digby's enthusiasm and expertise and, by sheer co-incidence of course, it also provided us with a well attended first AGM! At the end of 2013 we determined that we lacked the resources to continue to produce our own ambitious workshop days and to offer meaningful membership benefits to subscribers. As a result we suspended our membership schemes and have been "in stasis" since then as. However, the dream of a home and support for UK a Cappella lives on.